This book is a second, revised edition of the original 1986 publication. Since then, the issue of contract change has increasingly challenged the business community and legal practitioners. The world-wide recession may well have accelerated the need to secure contractual relationships by reasonable flexibility. Successful foreign investment, a relentless challenge, is subject to many unpredictable errors. Of all these variables, however, successful investment is most dependent on the investor-host country relationship, which is the object of the present study. In particular, the pressure by host countries for contract change and its counterpart: the investor's defence of contract stability. The book is essentially a reference handbook for legal practitioners. 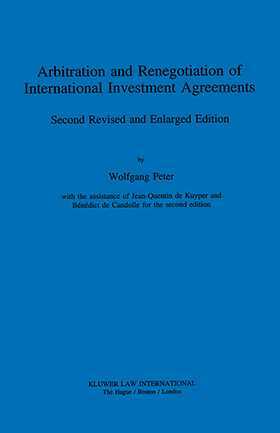 It analyzes a variety of increasingly important questions concerning international investment agreements that come under pressure for change by one of the contracting parties: either a transnational corporation or a host country government. The seven case studies and the analytical chapters which follow are based on the author's research and the assistance of corporate and government officials, experts from the United Nations and other organizations, and members of academic research institutes.